Palm, the once upon a time leader in PDAs and smart phones is all set to make a comeback. Even though Palm did have reasonable success with its Centro smart phone, it could never rival the popularity of the RIM BlackBerry or the Apple iPhone. Now it seems Palm is all set to make a splash with the upcoming 3G enabled Treo 850 rechristened the Treo Pro. 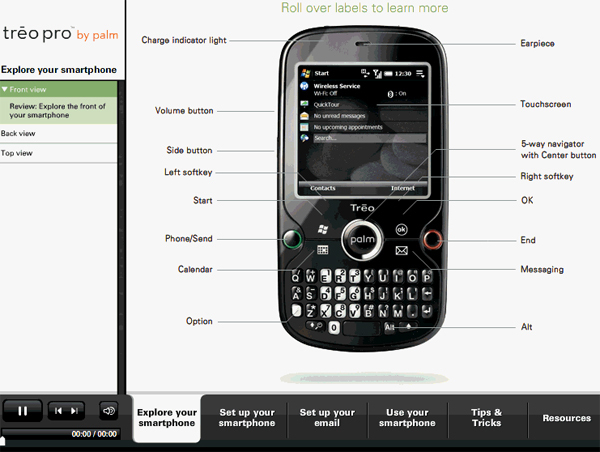 A Flash presentation of the Treo Pro recently went live accidentally on the Palm website earlier this week. Even though it was taken down soon, some people did capture a few screen shots. Here is what we can expect. Looks quite nice. The Treo Pro is expected to be slimmer than the Centro but with a more comfortable keyboard. First looks do seem impressive. The only let down is that it would be running on the latest Microsoft Windows Mobile 6.1 and not on Palm’s Nova, the operating system based on Linux, on which Palm is still working. Being a long time user of the Palm Tungsten E2 handheld, I can vouch for the preformance and reliability of the Palm OS Garnet. Even though handhelds from other manufacturers running Windows may have had a more attractive look they simply did not perform upto the same levels as Palm OS. The Treo Pro looks like a winner to me, but I would still like to wait for the Treo that would run Nova; just can’t compromise on performance.